This material world is working under the Lord’s direction. Material nature consists of the three modes – goodness, passion and ignorance – represented by the ladies dressed in yellow, red, and blue respectively. 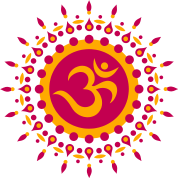 These modes are emanations from the Supreme Lord, Krsna, and He is not subject to their influence. There are actions performed in ignorance, actions performed in passion, and actions performed in goodness. 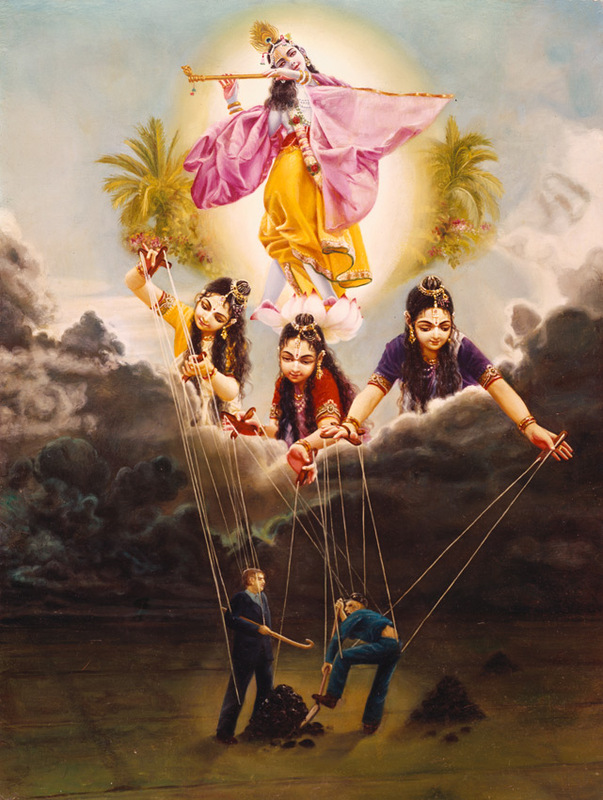 In his constitutional position as a servant of the Supreme Personality of Godhead Krsna, a living entity is above the three modes of material nature. Still, because he has become conditioned by the material world due to his forgetfulness of his eternal friend, the Supreme Lord, he is acting under the spell of the three modes of material nature. All men are forced to act helplessly according to the impulses born of the modes of material nature; therefore no one can refrain from doing something, not even for a moment. The spirit soul bewildered by the influence of false ego thinks himself the doer of activities that are in actuality carried out by the three modes of material nature.